Where it's all about the doggie. The only ladder with Solid Stop™ that gives your dog confidence and stability. Featuring a barnacle free design that will provide years of swimming enjoyment for your animal. 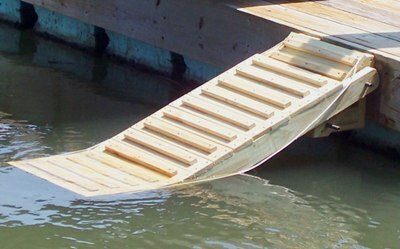 Our ladders can be installed on floating docks, swimming pools, piers and seawalls. Doggie Ladder Shipping Flat rate = $150.00 Fedex Shipping. Selling to happy customers everywhere! Please let us know if there is anyway we can help. Feel free to call 912-507-7333 for further details. Wholesalers are welcome!